Michel Adam, Stéphane Robineau, Gilles Gayraud, and Milou, with Marco Foyot in the commentators chair. Photo by Martha Lewis. The 2007 edition was won by the team of Gilles Gayraud, Michel Adam, and Stéphane Robineau (this same team hadlost in the semi-finals in 2005 and the quarter-finals in 2006). Readers of my reports from the Marseillaise, Millau, and the French national championships will recognize the names. Gayraud won the Marseillaise in 1998, and has been a semi-finalist on three other occasions. Adam had lost in the semi-finals four times over the last decade, and is famous for having thrown his balls into the Port after losing in 2001. Robineau, who won both the singles and doubles at Millau in 2006, was playing in only his third Marseillaise. They defeated three members of the Molinas clan: Louis (father, winner of the Marseillaise in 2002), Joseph (son, loser in the final of the Marseillaise in 2001, 2003, and 2007), and Fernand (son, winner of the singles in Millau in 2003). The game was neither close nor exciting, lasting only eight rounds: 2-0, 3-0, 5-0, 7-0, 7-2, 12-2, 13-2. This year, I lost in the ninth game and thus was unable to watch many great games. Nonetheless, the week was full of the usual high drama and surprise. On the first day, some major contenders lost including formwer world champs, Henri Lacroix, Julien Lamour, and Eric Sirot. Three-time World Champion, Sirot, playing with Robert Leca (a former singles champion at Millau), lost 13-1 to a team of unknown teenagers – in the very first game. Thailand – which would host the 2007 World Championships in September – fielded its two national teams, including the defending world champion shooter (the teams lost in the 5th and 7th rounds). In the seventh game (Tuesday), two-time winners Philippe Quintais and Philippe Pécoul, playing with Simon Cortes, defeated “Passo” (Michel Schatz) and Jean-Pierre Daudet – a tandem that lost in the finals here in 2004, 2005, 2006 (an unimaginable achievement actually). To do so, Quintais had to shoot the bouchon twice in the final rounds. Quintais would lose the next day, in the ¼ final against Gayraud. I played with Marco Gouast and Antoine . We won our first seven games relatively easily, never giving up more than six points, though we played several former national regional champions. In the sweet sixteen (the 1/16 final), we lost 13-12, after leading 12-7. This loss was the most devastating I have ever experienced, not because we lost, but because of how we lost. Leading 12-7, I put my first ball six inches in front of the bouchon, at ten meters, playing on pavemeny and pebbles. Our opponents pointed, short by a meter. They then proceeded to miss four shots in a row (my point was, after all, the 13th). The last shot, however, took the bouchon to the back where it rested nestled among their missed boules, tight against the stone wall of the big fountain in Borély (there is no out of bounds in the Marseillaise – everything is “good.” We shot five times to dislodge the ball to no avail, thus giving up four points. In the next round, at ten meters again in a ferociously tough place to point, the opposing pointer put his boule eight inches in front and to the right of the bouchon. My first point was short, but my second won the point, resting on the opponent’s boule, six inches from the bouchon. Our adversaries then proceeded to miss – again – four times in succession. With one ball left, the middle, cursing, literally threw his boule into the ground from the circle and … won the point, resting on my boule. Antoine shot, perfectly, but my boule ran five meters back, and the opponents boule took the bouchon back for two points, one at six inches the other at one meter. Antoine shot again, at 11 meters, taking out the closest point. Marco then had two balls to win, and a meter to do it in. 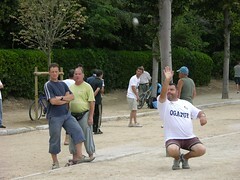 Both of his boules were left more than a meter short. It was now 12-12 and we lost on the final boule of the next round. Martha took more than 300 photos, and made a selection of favorites. Click here for Martha’s favorite pics from the 2007 Marseillaise. I was the last foreigner in the tournament, which meant an extra two hundred Euros in prizes. Click here for Martha’s photos from some of our games, the 2007 Marseillaise. The semis and finals were played in the blazing sun on Thursday. Click here for Martha’s pics from the semis and finals at the Old Port, the 2007 Marseillaise.